How does a wrist brace provide wrist support to help relieve and prevent injuries? Without adequate support, the repetitive motions of many sports can cause undue strain on the wrist. Body Helix wrist wraps employ cutting-edge fabric science technology in order to provide robust support to the wrist's flexors and extensors. 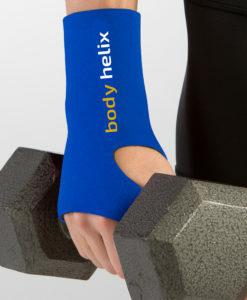 Athletes competing in sports such as volleyball and gymnastics will find that utilizing a wrist sleeve can help protect the tendons of the wrists. What types of injuries and conditions can a wrist support wrap help alleviate? The best wrist wraps are designed to provide relief for multiple injuries and conditions. By helping to maintain support for the wrist's tendons through the application of uniform compression, wrist guards can provide respite from the strain of repetitive motions and help manage the injuries that result from these motions such as wrist sprains and wrist strains. The Wrist Helix also assists in supporting the extensor tendons and allowing for better proprioception, helping to relieve the pain often associated with tennis elbow. 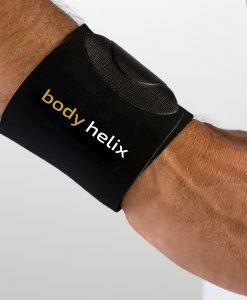 Lastly, chronic conditions such as arthritis are soothed by the warmth and support furnished by Wrist Helix wrist wraps.